Meat needs to sear, and that's why you have hot-burning lump charcoal. But it also needs to cook slowly and to absorb smoke. So always put coals on only one side, so you'll have a "two zone" grill. One side is for attaining the burnished mahogany crust that looks so good and tastes even better; the other is for cooking to a juicy, tender interior. 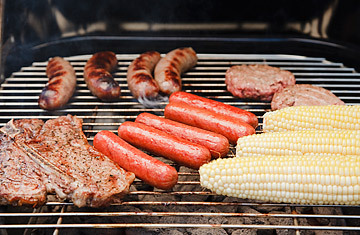 Grilling is just a small part of barbecuing. It's aggressive and fast, and meat needs some gentle, loving treatment as well. Basically, the art of cooking meat is the art of not doing things to it. As in, not burning it; not moving it around too much; not cutting it too fast, before the juices have had time to settle back into the muscle tissue; and not overwhelming it with weird sauces or seasonings or mostardas or compotes or chutneys or other things not made of meat. You want to draw it out, like an introvert in group therapy, and let it open up at its own pace. Beginning barbecuers are often tempted to check in often on their meat, to make sure it's still there. Don't worry. It's not going anywhere. Ideally, you should leave it alone the whole time, but a kettle-style grill like a Weber requires you to periodically replace charcoal. The second you lift the lid, you lose much of the heat  and you don't get it back right away. Imagine trying to do your taxes and having to stop every 15 minutes to answer stupid questions about domestic issues like where the scissors are. That's what you are doing to your meat when you keep checking on it. Keep your interruptions to a minimum. Think of the great home cooks you know. Do they bustle nervously over every dish? No. The better they are, the less they seem to do. That's how barbecue is  times 10. It's almost impossible to oversalt meat that goes on a grill  that is, if you're using coarse kosher salt. Unlike table salt, which just makes meat salty, coarse salt doesn't melt; it becomes a crust. That crust tastes good. You know what also tastes good? Having coarse black pepper along with the salt. Both serve as flavor enhancers, rather than as competing sensations. Be careful, though. Unlike salt, it is possible to use too much pepper. Any other spices or rubs should be used sparingly, if at all. If your meat doesn't taste great with just salt, pepper, fire and smoke having been applied to it, you either need a new supermarket  or you need to step up your grill game. There's a reason that the crappy barbecue you get in mall food courts is slathered with sauce. It's because the underlying meat has no flavor. Sure, it's easier to boil or microwave ribs than it is to patiently smoke them, just as it's easier to cheat on your wife than to be faithful to her. (In both cases, the shame of the crime is shown by the hasty, desperate lies that surround it.) Barbecue sauces should be used sparingly. They should highlight, rather than envelop the meat, and they should be part of the cooking process. You might also consider mixing some of the hot meat juices in with the sauce before serving it. As for which sauce to use? Just keep trying them. I steer clear of anything with liquid smoke  an evil fluid I try to avoid like dysentery  listed in the ingredients. (It's almost as unmistakable and nasty as truffle oil.) Maybe give the high-fructose corn syrup a pass too, unless you are overly fond of obesity, diabetes and the taste of Tootsie Rolls in your ribs. Try a simple "board dressing" instead, as demonstrated by my friend Adam Perry Lang in this video. His combination of meat drippings, olive oil and fresh parsley mixed directly on the cutting board is better than any sauce. But really, you don't even need a board dressing when you come right down to it. Those are just the basics. But the basics matter the most. You don't need a 50,000 BTU gas grill, you don't need a water pan, you don't need foil and you don't need a remote digital thermometer. If you want to barbecue  and as an American in the summer, you really should want to barbecue  then learn how to cook meat with coal. The embellishments can come later. There are any number of superb cookbooks, such as the fine ones by masters like Lang, Stephen Raichlen, Michael Stines and Paul Kirk, if you start feeling adventurous. But for my part, if I've produced a rack of smoky spareribs, a perfect half-pound hamburger or an iridescently glazed prime rib, I rarely rue the absence of a complicated recipe or high-tech tool. And neither will you. Josh Ozersky is a James Beard Awardwinning food writer and the author of The Hamburger: A History. His food video site, Ozersky.TV, is updated daily. He is currently at work on a biography of Colonel Sanders. See more of Josh Ozersky's Taste of America food columns here. See the 10 worst fast food meals.